Valentine's Day seems to be an interesting time to reflect on romantic themes in art. There is a wonderful post at David Packwood's Art History Today on Two Star Crossed Lovers, and Monica at Alberti's Window looks at Valentine's Day kisses. I must admit, I have not spent much time reflecting on the theme of Love depicted in art, but one enduring example comes from my days studying Renaissance Literature - which would be known to many fans of the Renaissance, and of the Pre-Raphaelite Brotherhood who made much of the infatuation of Dante Alighieri for Beatrice di Portinari, daughter of a Florentine banker. As outlined in the heavily autobiographical La Vita Nuova, Dante first met Beatrice when he was aged 9, and she 8. Dante was instantly enchanted by her, and was to remain so for the rest of his life. Dante again met Beatrice 9 years later in 1287, following her marriage into the wealthy Dei Bardi banking family. Although Renaissance poet and humanist Giovanni Boccacio mentions Beatrice in his commentary on Dante's Commedia, there is little documented evidence attesting Beatrice's existence, save for a mention in her father's will, bequeathing her an amount of money. Beatrice's remains are allegedly interred at the Santa Maria de' Cerchi in Florence, though little documented information exists to confirm this. Young Dante's infatuation with Beatrice is seen by literary scholars as an expression of courtly love, espousing Medieval traditions related to chivalry, as opposed to anything governed by more base urges. Dante used to haunt areas of Florence where he was likely to catch a glimpse of Beatrice, though there was only one other meeting described. This allegedly occurred in 1287, nine years after the childhood meeting - which would have made Dante and Beatrice around 18 and 17 years of age respectively. "...betaking me to the loneliness of mine own room, I fell to thinking of this most courteous lady, thinking of whom I was overtaken by a pleasant slumber, wherein a marvelous vision was presented to me: for there appeared to be in my room a mist of the colour of fire, within the which I discerned the figure of a Lord of terrible aspect to such as should gaze upon him, but who seemed there-withal to rejoice inwardly that it was a marvel to see." 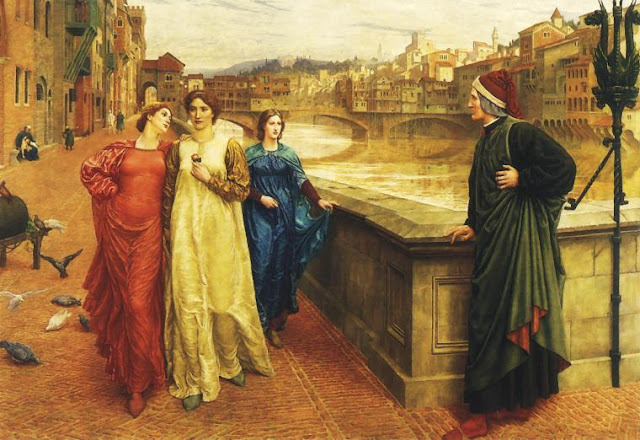 Despite her death at age 24, and Dante's subsequent marriage, the ideals Beatrice represented to Dante were to resonate in his most famous work, the Commedia - where Beatrice replaces Virgil as Dante's guide in Paradise, owing to the fact Virgil was a pagan and therefore not admissable. This second meeting has been famously depicted in art, my favourite version of which is Pre-Raphaelite Henry Holiday's Dante and Beatrice(1883). Although we are not sure where the meeting actually occurred, Holiday has depicted it at the Ponte a Santa Trinita in Florence, which you can see the modern day view from below. This spot is commonly visited by Tourists who have a fondness for Renaissance literature and art - I visited it myself last year - noting it is a popular spot for modern day affectations of love in the form of graffiti. Taken from Google Street View the modern view of the spot depicted in Holiday's painting. Beatrice as an ideal of love and obsession was popularised by the 19th Century artistic movement known as the Pre-Raphaelite Brotherhood, particularly with Dante Gabriel Rossetti who was to depict his wife and muse, Elizabeth Siddal as Beata Beatrix. It is interesting to note this work was completed two years after Siddal's death in 1862, with Rossetti working from existing drawings. For more on this image, including scholarly commentary on its symbolic elements, visit this entry at The Rossetti Archive. In researching this post, I was fascinated to discover Rossetti painted this image more than once. The above version is dated 1864 belongs to the Tate Britain, yet the Art Institute of Chicago also lists a similar work, dated 1872 which includes an extra element of the story in a panel on the bottom. This represents Dante's next meeting with Beatrice, which occurred in the verses of his Commedia. Below are Rossetti's own words - it is sad to note that he often referred to Siddal as 'his Beatrice', it makes the emotional resonance of this work after Siddal's death all the more stronger. "...The painting is not as a representation of the incident of the death of Beatrice, but as an ideal of the subject, symbolized by a trance or sudden spiritual transfiguration. Beatrice is rapt visibly into Heaven, seeing as it were through her shut lids (as Dante says at the close of the Vita Nuova): "Him who is Blessed throughout all ages"; and in sign of the supreme change, the radiant bird, a messenger of death, drops the white poppy between her open hands. In the background is the City which, as Dante says: "sat solitary" in mourning for her death; and through whose street Dante himself is seen to pass gazing towards the figure of Love opposite, in whose hand the waning life of his lady flickers as a flame. On the sundial at her side the shadow falls on the hour of nine, which number Dante connects mystically in many ways with her and with her death. The date below the predella (31st March 1300) is that of Dante's meeting Beatrice in the Garden of Eden. The date 9 June 1290 heading the main panel represents the date of Beatrice's death." This was a really interesting post, good job 3p! Yes, great job, what could be more fitting. I ended up reading Plato's Symposium after La Vita Nuova to get a better understanding of Dante's visions as he describes them - his lady in a veil carried by a weeping soul. It's a very interesting read even if Dante was not building on Socrates' ideas (as described by Plato's Symposium) and makes you think deeply about 'desire' and 'love'. Great post! Thanks for linking to my blog, as well. 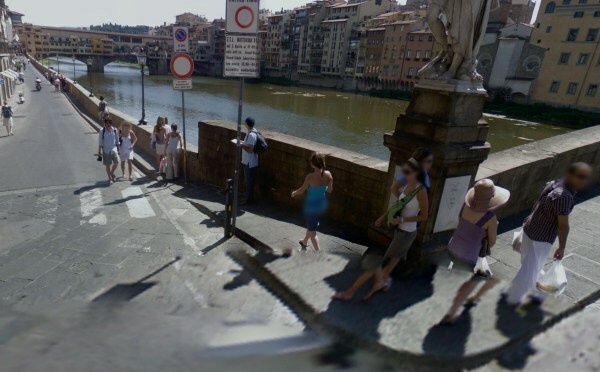 I didn't know that Holiday had depicted his scene at a specific location in Florence; it was fun to see the Google Street View and compare it with Holiday's painting. Elizabeth Siddal is a very interesting figure to me. I think there's another parallel between Siddal and Beatrice: Siddal's tragic death at a young age (she was 32 and purportedly committed suicide) has parallels Beatrice's untimely death at 24. If I remember correctly, Siddal died from a laudanum overdose--or that was the official story, anyway. 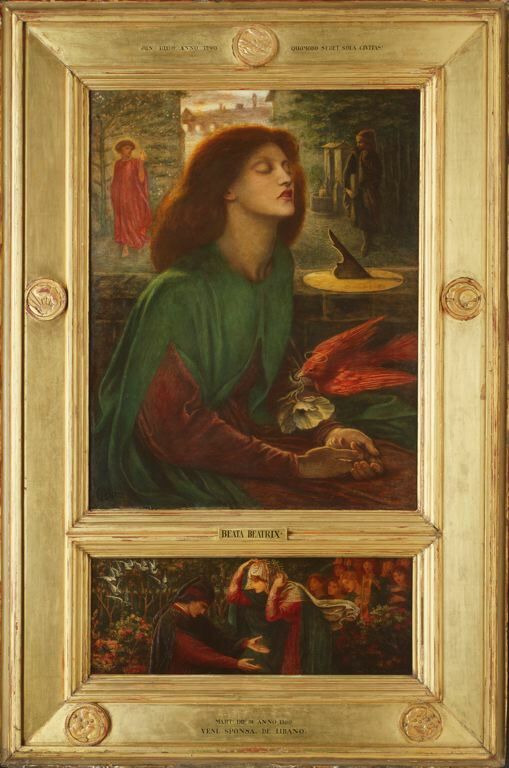 If you look at Rossetti's portrait of "Beatrice," there are references to poppies, as well as the time of her death. What a fun post! I've always really liked the story of Dante and Beatrice (though, as an adult, it is slightly creepy and/or stalkerish). Lots of fun to read this post! @Ben - Plato's Symposium is definitely a pre-requisite for anyone wishing to explore the works that shaped Italian literature, particularly Dante and later Renaissance writers. @e - glad you enjoyed the post! Courtly love is based on innocence and virtue - though admittedly to our modern perspective does seem excessive. Still, looking at popular modern works like the Twilight Series - I find the relationship dynamics in that far more creepy than Dante writing lovely poetry to honour his muse! On a side note, this talk of Beatrice reminded me of the word 'Beatify' Most dictionaries attribute this word to a French/Latin derivative but I have a feeling it's meaning best came into focus following Dante's exultation of Beatrice in La Vita Nuova and the Commedia. Fascinating as always. Including a modern shot of the Ponte a Santa Trinita was brilliant! What about Mrs. Aligheiri? what did she think of all this? @Vicky - I'm glad you enjoyed the post. Although I did walk past it and got pics near it, I never managed to get a photo from that exact spot when I was in Florence last year. I was planning to do but got sick in my last two days so missed out on doing a few things! At least Google Street View gives us an idea of what it looks like. @Frank - Mrs Alighieri is Gemma Donati. There is some disagreement over dates, but it is widely believed they were betrothed (by their families) when Dante was 12, but they did not get married until after a year after Beatrice's death - at the same church where Beatrice's remains are meant to be. It is important to note Gemma was never mentioned in any of Dante's surviving works, nor accompanied her husband when he was exiled from Florence. We can only imagine what Gemma used to think when she read La Vita Nuova! Cheers for the comment! Have a great trip. On a related point - I was just reading about the German occupation of Florence in WW2 - the Ponte a Trinita was one of the bridges destroyed by the Nazis as they withdrew from Florence. Only the Ponte Vecchio - which Hitler was apparently quite fond of was spared in this instance. Hence the bridge at Santa Trinita we all traverse these days is a relatively recent constructionm though in the same spot as the original of course.